Home The Adventure Chile Fly! Fly Away Sweet Apple! I’m going to keep this short. Relatively short at least. I mean, let’s face it – they’ve been getting a little long-winded of late, haven’t they? I guess there’s probably more to it than that though. Maybe I haven’t done very much recently. That does sound like me, if I’m honest. Always delaying and moving slowly. Am I waffling? 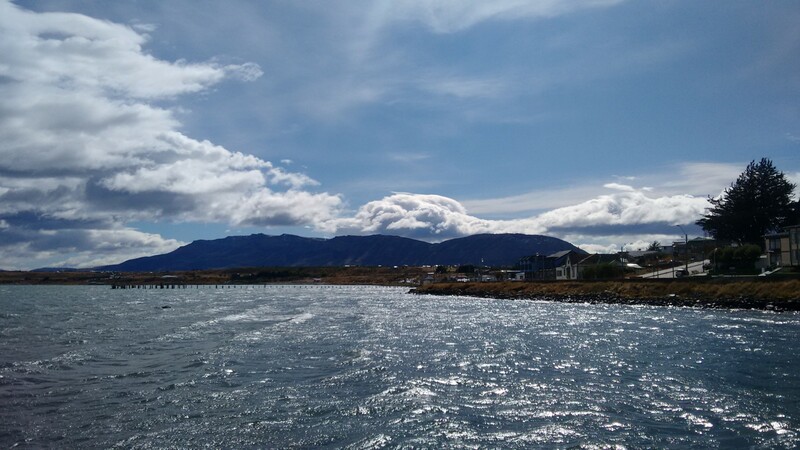 So I left Ushuaia on a wind of change. A wind of changing locations without really seeing anything. I was up at 3.30 in preparation for my morning walk to the bus station, where my (rather dingy) carriage would leave at 5AM. It was brisk at the end of the world. After the slightly awkward issue of there not being enough room to store people’s bags was solved, we set off on my return journey to Rio Gallegos. Colourful roofs abound in the south. They’ve not got a lot of other colour, have they? The other was that we saw porpoises! No tour, nothing. There were just a whole bunch of these black and white bodies periodically bobbing up and down in the water alongside our boat. We actually wouldn’t have seen them if it hadn’t been for a nice Argentine bloke pointing them out to us (we were facing the wrong way) and it was awesome watching them appear everywhere around. 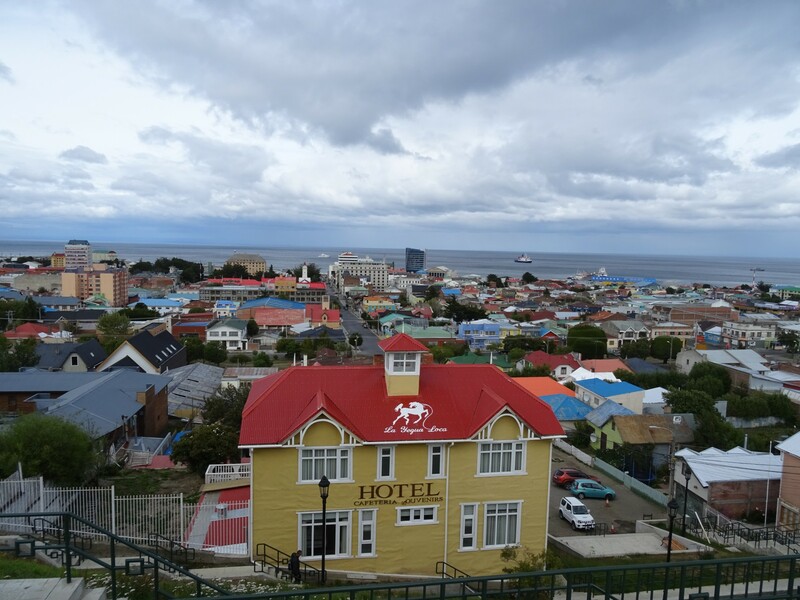 It’s clean and neat in Punta Arenas. 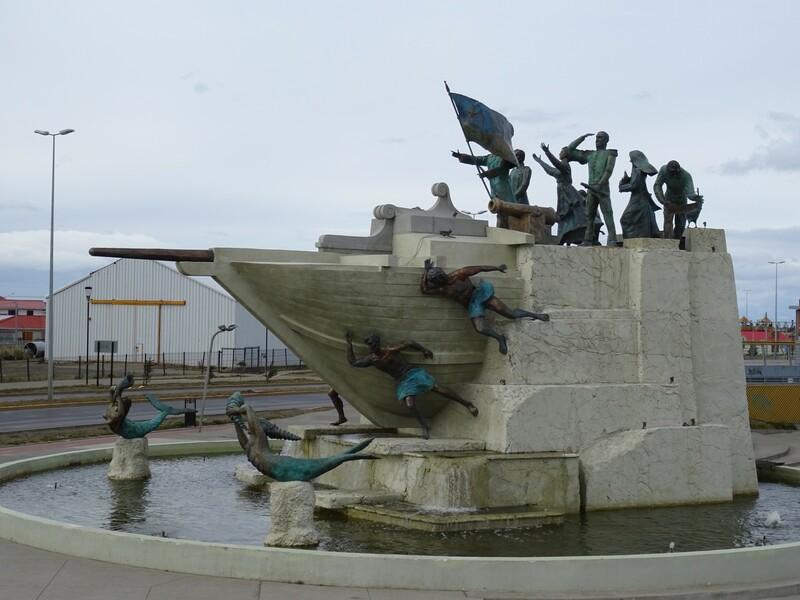 I was off to Punta Arenas the next day, having seen about as much of Rio Gallegos as the previous time I’d stopped by. 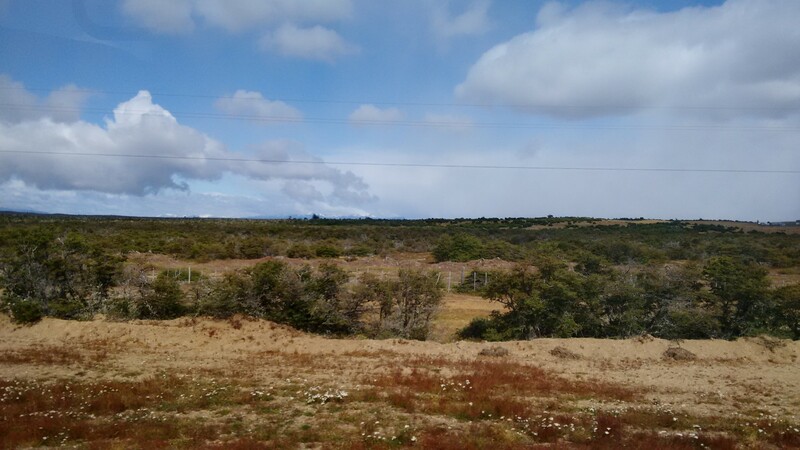 The clouds loomed as I reached my first Chilean town, and I thought the sky was about to fall, but as luck had it the storm passed by and I managed to make my way to the hostel, dry. Essentially we’re a long way from anywhere. 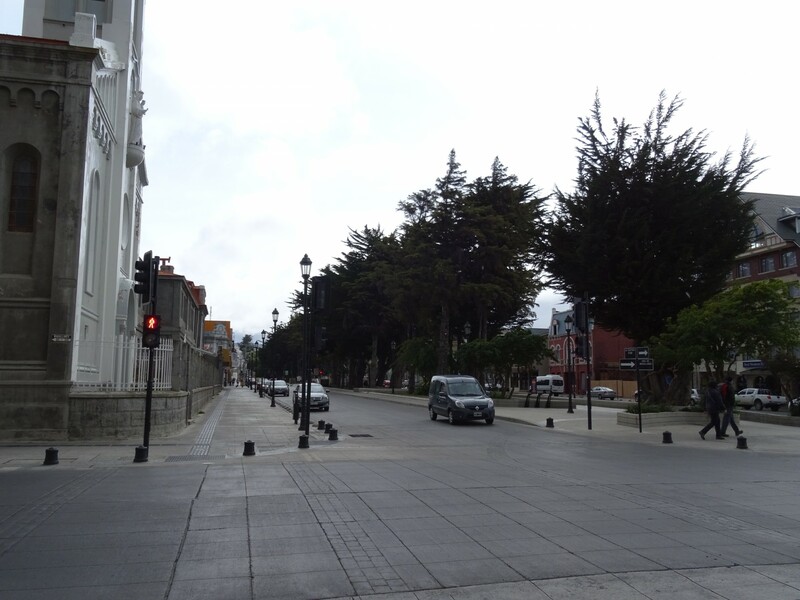 Punta Arenas is a bit more welcoming than Rio Gallegos, and the main street is really quite nice. There really isn’t too much to do in the town though. Aside from a debatably worthwhile penguin excursion (the girl at the hostel advised me that there were only about 20 penguins at Seno Otway) no one seems to be able to suggest to much to do. Just take in the views over town, and watch the waves hit the shores in secluded cafes. That and debate the value of having a monarchy with hostel workers. However, my overriding impression of Punta Arenas is that it’s windy. Very windy. On my second day there, in a vain attempt to pass some time on a beer factory tour, I braved the blasts. I spent the journey being pushed left and right, forward and backward, just as I walked along the road. I didn’t even get into the tour either. It turned out to be full – apparently everyone else had had the same idea. 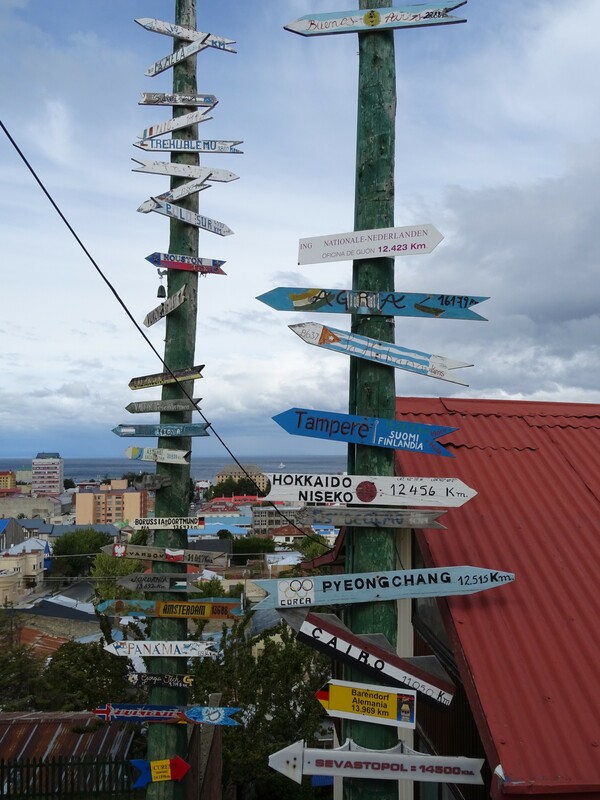 That was enough excitement for Punta Arenas, and I was soon on the bus to Puerto Natales. I hadn’t realised this was an issue in Chile. 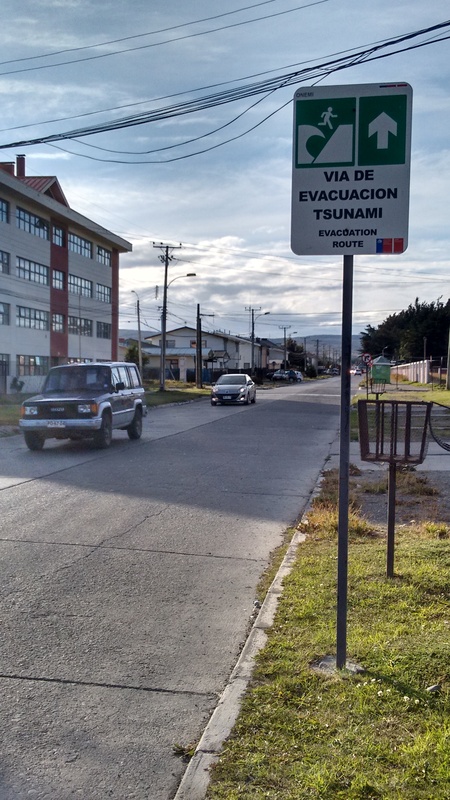 Puerto Natales is where the waiting game began. 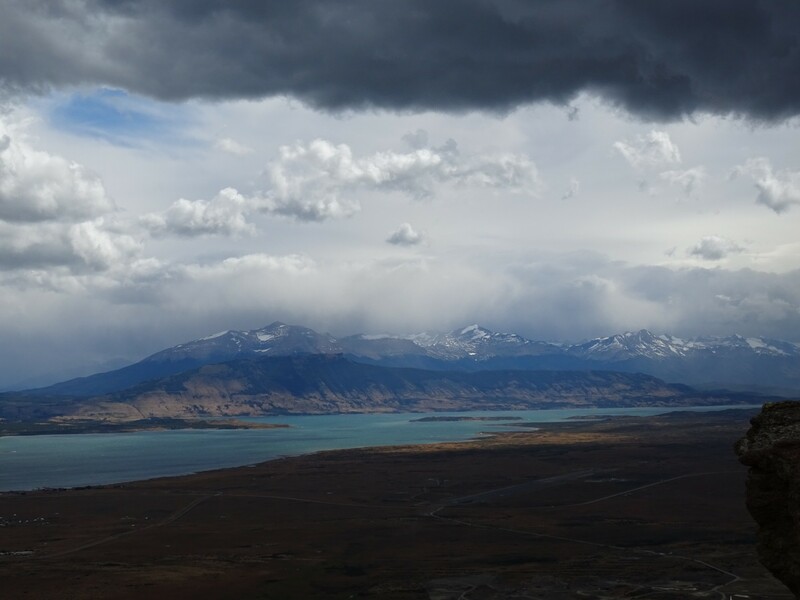 I wanted to go to Torres del Paine, but I couldn’t. While I waited, I met up with those who had already – Christina, after her bus tour around the national park – and Halabi, after his weather hit attempt to hike the W. I also continued to hear varying reports of the situation in Torres del Paine – the French Pass being closed, a bus being blown over in the park, and the various stories about the injuries occurred as a result of this. I overheard my hostel owner, Yari, say a couple of girls had had to go to Santiago after losing some teeth, but others suggested there had been spinal injuries involved. 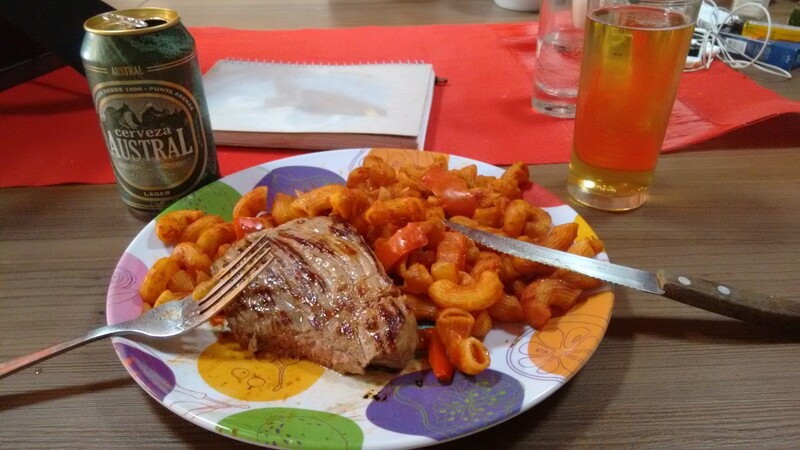 Steak and beer. What else do I need? Yet I still had to wait. It was my own fault, really. He’d expressed an interest, so I’d invited him along, in the thought that he’d enjoy it and I’d do a bit more adventurous trekking. Now, I’d have to spend all this time with my dad – in a tent as well. I mean, seriously, who does that? 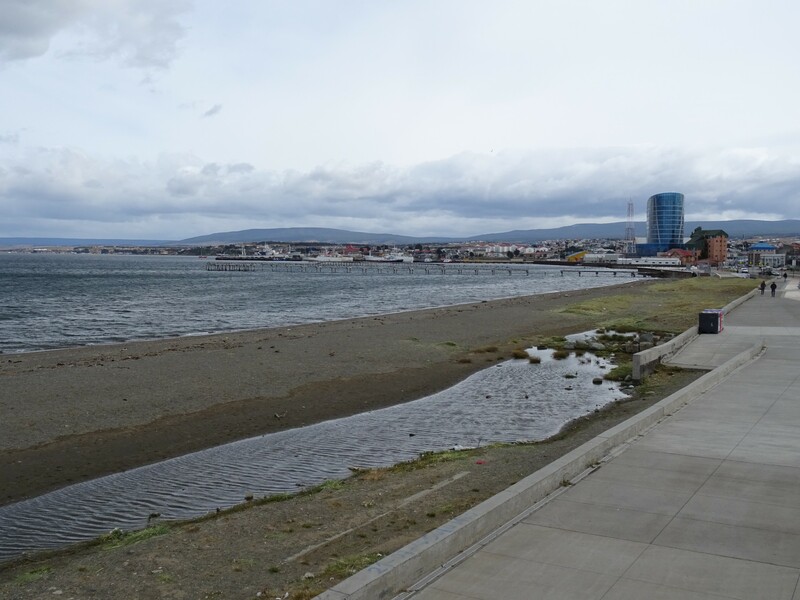 My dad and I spent the next morning taking a look around Puerto Natales, something I had already done, of course. We strolled down to the coast first. The view over the bay is stunning – a panorama of untouched mountains, and I realised this was the first time I had looked over the Pacific. 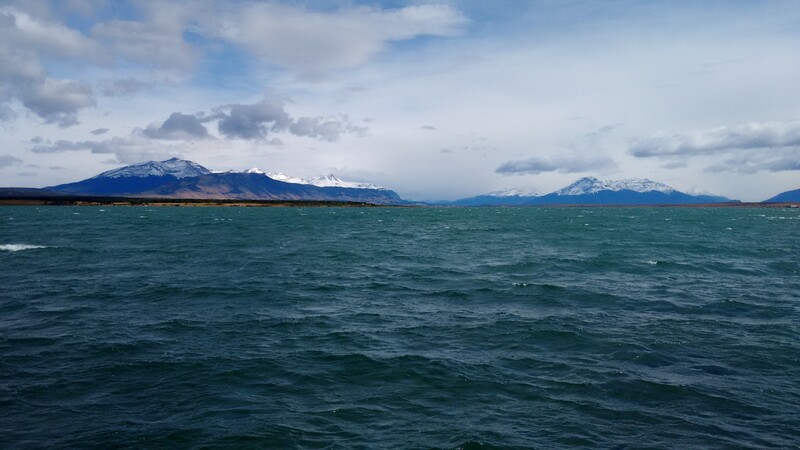 Not that you could tell – Puerto Natales is set deep within miles of fjords – but I’m pretty sure it counts as the Pacific Ocean. Patagonia desert on the way to Puerto Natales. By this point, I’d obviously been hanging around the hostel for a few days, and despite doing my best to leave most enquiries till my dad was here, had inevitibly asked Yari, the Finnish hostel owner, a few questions. “You should go to the mirador today”, we heard the moment we stepped into the hostel. He was talking about Mirador Dorotea, the hill behind Puerto Natales. I’d asked about it once, with the genuine intention of going, but the tally of talks about it had probably reached about five, now. “The weather is not good tomorrow”, we heard in response to our excuses. This was Yari all over. When he knew something, you knew it too. Looking out over the mountains. So we did. It was rather later than we had otherwise planned, and did involve a debate with the taxi driver as to how long he thought it would take us to get back down again (and thereby what time he needed to be back for) but it was a good decision. We paid the gatekeeper, a horrendously slurred elderly Chilean, who really could have been anyone as far as we knew, and set off for the top. As we suspected, it really didn’t take as long as suggested, though uphill all the way. We considered this a nice warm up for the Torres. As we advanced further up the nondescript path, it changed from moor to woods, ending in a large power mast by the lookout. Before the view though, we had to pass by the mast and another building, and here the wind was fierce. The inkling we’d had as we’d climbed to the top was confirmed, and more besides – walking was suddenly a struggle as the wind swept over the top, lifting us off our feet and pushing us into the floor. Yet it died again almost straight after exiting that narrow corridor. The view was worth it all. Across the bay, the mountains we’d watched earlier were bright and clear, along with miles more all around. Better was to come though. We stopped for a bite to eat, admiring the views, and after I finished my apple, I threw the core (sorry, Chile!) off the edge of the cliff. And it flew. Like an eagle soaring, or a press of Bernard’s watch, the core hung for 10, 15 seconds, maybe more, before starting to fall. It was magical. Scrap the view. That made it totally worth the trek. I reckon the apple probably reached Puerto Natales! It was back to the serious stuff the next day. Preparation, preparation and (surprise) more preparation. Gas had to be bought, buses booked, hostel booked (because accommodation is manic in Puerto Natales), campsites booked for the trek, food bought and planned, and everything packed. Unfortunately, that meant my neatly packed bag of six months got ransacked and dumped into a bin liner. Devastating is not strong enough. Tomorrow, though, we leave. Six nights in a tent beckon. 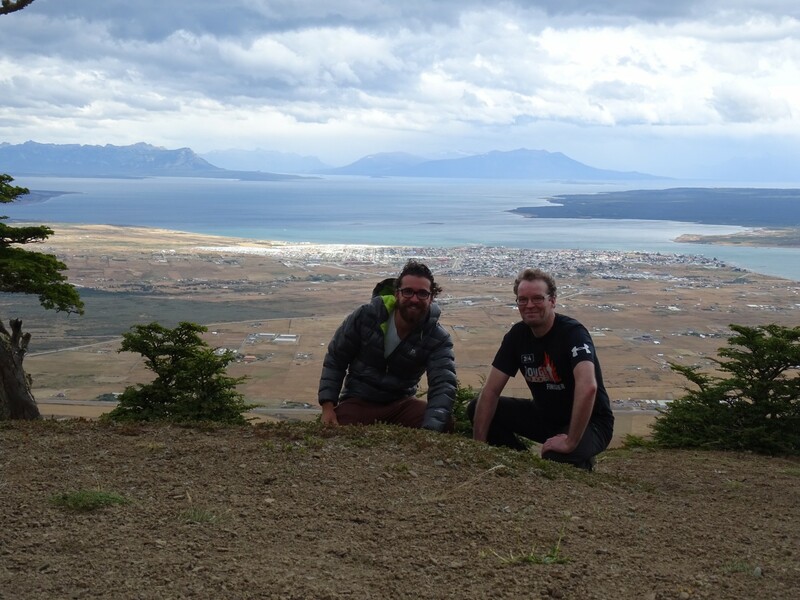 City Exploration, February 2016, Hiking, Mountains, Patagonia, Spectacular Views, Wildlife Galore. Bookmark.